I had coffee with a photographer friend this morning who encouraged me to share my good news on LENSCRATCH. 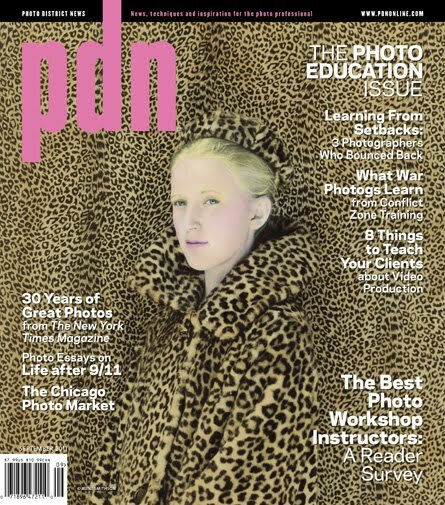 I try to steer away from using this platform to showcase my own work, but hey, how often does one see their image on the cover of PDN? So, forgive me, but I’m pretty excited. Almost a decade ago, I received my first magazine cover–on SHOTS Magazine. It was utterly exciting for me, as I was tethered to my life as a wife and mother and had few photographer friends, certainly none that I actually knew in the flesh. I had brief correspondences with (via snail mail) photographers I admired through SHOTS, but no real community, and no where to share my excitement. But it made me feel validated that someone (that would be Russell Joslin), recognized something in my work worth sharing–and that was huge in my small world. your photograph Hotel Fiorita moves my heart soft and silent. That post card still hangs directly over my computer as a reminder to shoot with the heart, not the head. I have no idea who “c. l.” was or is, but if you are reading this post, thank you for taking the time to share that with me. And while I’m at it, thank you Russell Joslin, and the staff at PDN, in particular, Amber Terranova. This entry was posted in Contemporary Photography, L E N S C R A T C H, Uncategorized and tagged Contemporary Photography, Correspondences, Decade, Excitement, Flesh, Handwriting, Hotel Fiorita, Joslin, Little Prince, Pdn, Photograph, Photographer, Photographer Friend, Photographer Friends, Photographers, Photographs, Photography., Reminder, Shots Magazine, Showcase, Snail Mail, Taking The Time, Terranova, Voici Mon on August 3, 2011 by Aline - lenscratch.blogspot.com/.